Stretching and proper warm-ups are two of the most underrated and underused parts of working out, and yet, they are perhaps the most important. Far too often we want to just dive right into our workout while we’re feeling motivated, but the cost of skipping stretching and warm-ups can be immensely high. The types of stretches you do depend on the type of workout you’re planning on, but they can definitely overlap. And our personal trainers will be the first to tell you that any type of stretching that you take on can only help you. Take a look at these warm-ups and stretches, and contact Cypress Fitness to get the best in personal trainer services and group classes. Cycling isn’t one of the most taxing exercises that your body can endure, but it still can lead to soreness and injury if proper warm-ups aren’t implemented. Whether going on a stationary bike or on the open road, you should begin by opening up your hips with some leg swings. Try for 10-15 for each side — you can use your bike as a stabilizer. You’ll likely find this stretch to feel pretty great, and to feel things open up a little more before you start to bike. A lot of people who bike regularly complain of low back pain, which can come from hunching over the handlebars and sitting on the not-so-comfy bike seats for extended periods of time. Start out with the cat-cow pose that’s familiar to anyone who does yoga before you get on your bike, and repeat afterwards to alleviate any immediate tension. Runners are typically prone to doing hamstring stretches and calf stretches before they hit the pavement or trail. Unfortunately, these stretches — while still beneficial — don’t give the proper warm-up that runners need to protect their bodies. Dynamic exercises, such as walking lunges and foam rolling, are a really good way to get your heart rate going, and to also prepare your muscles for the workout ahead. 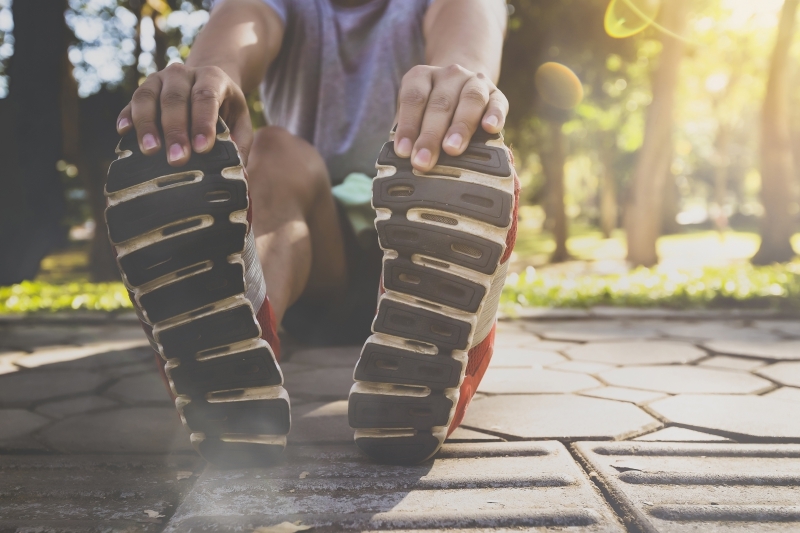 Running is pretty taxing on the body, and it’s necessary to take proper precautions to protect yourself and to keep running an activity, long in your future. Interestingly enough, the static stretching (like touching your toes or poses where you hold your position for several seconds) that we think of before running should actually be performed after your workout. This gives your muscles proper time to rest and recover. Weightlifting is pretty straightforward — whatever muscle you’re targeting should be the muscle that you’re focusing on stretching and warming up, both before and after your workout. Arm swings, leg swings, shoulder rotations, squats, walking lunges — all are great examples of how to keep your muscles moving and warmed up for the heavy weights ahead. At our gym in McLean, our personal trainers will usually have you combining your weightlifting with some other cardio exercises that also help warm you up. Jumping jacks, jump squats, jump rope, and pushups are all examples of activities you can expect to do while you’re prepping for your next set of reps. If this all sounds foreign to you, it’s OK! It’s a great reminder that you can come to Cypress Fitness and work with our personal trainers. We’ll help you learn the ropes to ensure your success and safety as you move along in your fitness journey. Contact us today to get started!